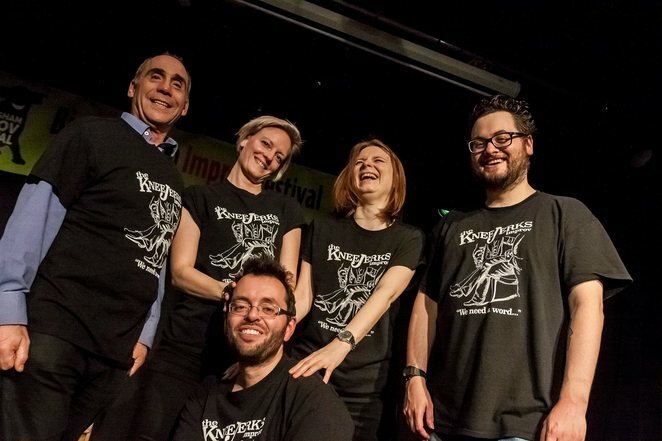 On Wednesday 15th November, the Victoria pub paid host to its monthly roof-raising as The Kneejerks took to the stage in an exceptional showcase of improv comedy. 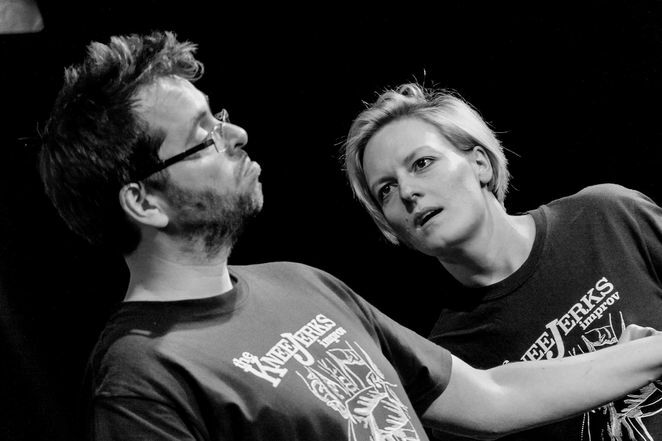 So, what is improv comedy, I hear you ask? Well, Google defines it as 'a story made up in the moment'. I define it as hilarious. Before last night, I had never been to an improv comedy show, I assumed it was niche and amateurish but I couldn't have been more wrong. The chemistry between the group was incredible and an excellent display of fast thinking wit; there was an infectious 'anything can happen' energy buzzing about the room. The night was split into two halves, divided by an interval for a quick refuel at the bar downstairs. In the first half the audience was asked to offer a word, camera, which sparked a range of spontaneously created characters in a variety of hilarious scenes including an ailing mother and her son; a pair of introspective prisoners and a conversation between two pocket knives in separate pockets. However, the stand out scene for me was a woman (Daniele Harford) asking for advice from her friend (Suzie Evans) about her Tinder profile, with occasional interjections from the cynical millennial waitress (Kate Knight). The second half was sparked by a discussion between the audience to provide some inspiration. It was like being with a bunch of friends, all united in this one unique experience. 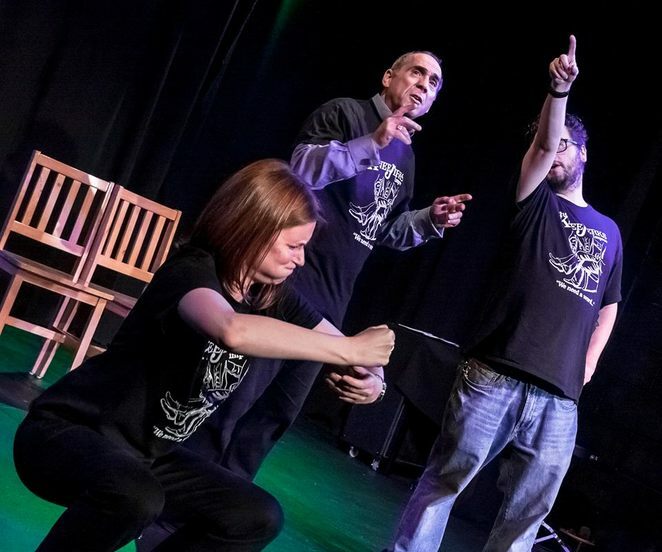 The ideas from these discussions then fed into a spin-off, developed from one character in the audience, chosen by the audience via a short-list and then democratic cheering. There was an 'anything can happen' energy buzzing about the room. And so, we saw the unfolding romance of The Courtship of the Banks-Davidsons. A courtship formed of a dispirited and disillusioned whittling teacher (Dan McKee) and his form obsessed, slightly neurotic wife (Suzie Evans) against the backdrop of the most helpful man alive (Jon Trevor), his long-suffering wife (Daniele Harford) and a very very purple school. I may have forgotten to mention that we first meet this pair flippantly debating whether or not to commit suicide by the means of a Euthanasia Centre. It was an absolute pleasure to be in such a creative atmosphere and bear witness to the birth of these completely original and organic sketches of comedy. In a world of re-runs and the touring comic set, the transience of this work could be keenly felt, creating a refreshing energy to the work. I cannot wait for their Christmas show on the 13th December, upstairs in The Victoria pub, Birmingham. They perform on the third Wednesday of every month and what's more, all this is completely free! For more information, like them on facebook and follow them on twitter.